The first several weeks of the AEV design period were spent focused on preliminary research and design to understand the basic functions of the provided software and hardware. 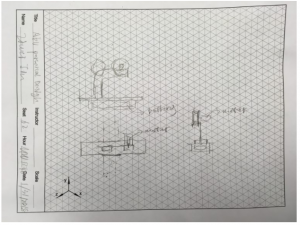 Since the AEV is completely controlled by an Arduino program, the group researched the various command calls by coding an example program and observing the resulting movements of the AEV on the small table-scale track. 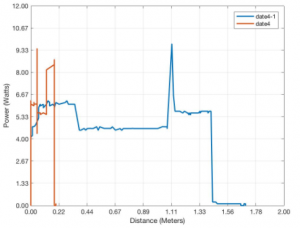 The group also analyzed the reflectance sensors with a sample code to understand how the distance travelled on a track was recorded and programmed on the mark system. Data analysis tools inside the program were utilized as well to obtain a greater understanding of the energy efficiency of the vehicle over both time and distance so future designs could be compared to the original efficiency of a reference model. 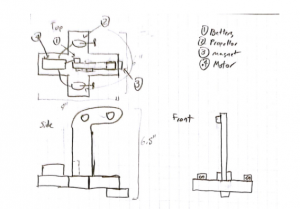 Finally, several individual design sketches were created by each member of the team as a way to brainstorm ideas before creating a group sketch and narrowing down the choices with scoring and screening matrices. In the first two weeks, the team completed two labs researching programming basics and the behavior of reflectance sensors. For the first preliminary research and design lab, the team was able to test the sample code on the AEV controller by utilizing an AEV motors mount desk stand. The desktop stand fixed the motors’ position, which allowed the team to closely observe each component’s performance. 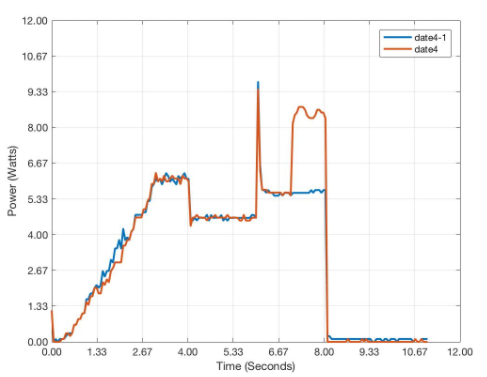 The team recorded a video as the chip ran the program, and the motor followed all the intended functions in the exact sequence after watching the video and comparing the movements with the code. At the start of the program, there was significant resistance in the motor at low speed. The team also noticed that one motor started earlier and accelerated faster than the other one in both of the trial runs. Although the cause of this observation is still unknown, the delay does not cause any problems for the AEV. For the second preliminary and design week, both of the sensors were active and working correctly, and the number of marks counted was what team counted exactly. The prepared command codes have some obvious limitations, and this may cause potential error in the later AEV design. For example, the break only cuts the power of the motor, and the AEV will keep moving due to momentum. A practical “break” with the current provided command code would be “reverse()” at a high power for a short period, but the time and power needed to slow the vehicle still need to be determined. 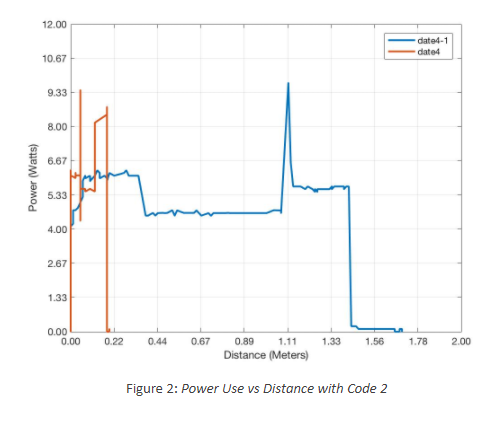 Another limitation of the code is that “motorSpeed()” does not give any clear indication of the actual power, but rather a relative percentage of the maximum. Therefore, the acceleration of the AEV given by the motor needs further testing. A possible solution would be writing command code that returns real time speed and acceleration, and the team can use this information to decide the power to put on each motor. One of the potential errors that the team is worried about is how the number of marks represents the actual distance traveled. The two sensor were placed close to each other during testing, which meant the interval distance passed by each mark count is not exactly the same because the sensors are not placed 45 degrees apart relative to the wheel. This slight variance may make the fine control of the AEV more difficult in future applications and requires more research. After the team finished lab 1 and 2, the went on design the actual sample AEV. 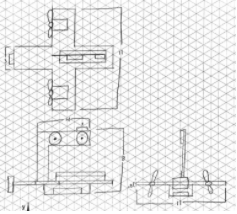 The final group sketch is located below in Sketch 5, and all other individual sketches and material bills are located in Appendix A. For the combined group sketch, the main points of emphasis were high energy efficiency, good time efficiency, and minimal cost. The first individual design concentrated on weight distribution and center of mass for the AEV, and the T shape designs allowed even weight distribution of the motors as well as a center of mass with the central battery location. This design also provided a greater friction force between the wheels and the rail, so the AEV would be better suited to stay balanced while moving along the track. The focus of the second design was to decrease drag and increase the aerodynamic favorability of the AEV. The cover over the front of the AEV was intended to cut back the drag force caused by air resistance and allow the AEV to move more smoothly, and motors on both sides were intended to balance the weight and provide thrust for the inclined portion of the track. Design three focused on lift as well as thrust to decrease friction on the track. Motors were placed at the front of the vehicle to increase thrust, and a wider base was used to ensure balance rather than moving components to create balance on a smaller frame. In this design, the motors are directly attached to the wheel and the propellers are not included, which is incredibly different from all other designs. By placing the motors directly on the wheel, less energy is lost through generating wind power, and all energy goes directly into the movement of the wheels. The final design in Sketch 5 was created by using some of the best ideas from each AEV design and incorporating each into a general AEV body. The base used in design one was chosen as the base for the final vehicle because it provided the most balance and best spacing for the propellers. Since the propellers have a delay to reach the assigned speed, placing each propeller in the middle of the vehicle allows for greater maneuverability as well. During research and development, the team discovered that air resistance does not have a large effect on the speed because of the lightweight characteristics and the relatively low speed that the AEV travels at. Therefore, the front curvature in design two was not used, but the minimalistic base was carried into the final design along with the safe spacing of the battery and motors. The consideration for lift in the third design was also emphasized in the spacing of the motors, and the team will be designing a second prototype using the motors on the wheels from design four to test if the energy efficiency improves by eliminating air power. The team performed two test runs with the code in Appendix B. In the first run, which is indicated by the red line, the prototype AEV was run on the short track on table. 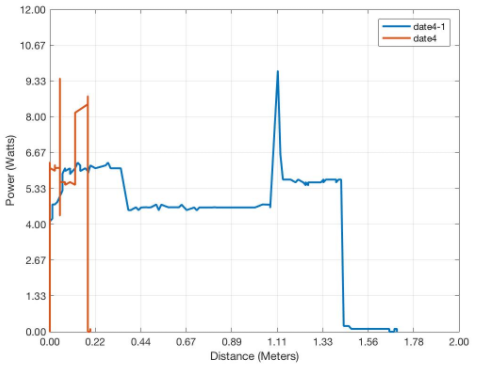 Hence in Figure 2, the graph shows that the total distance traveled was less than 0.22m. As the AEV reached the end and hit the edge, the propeller was stopped, and this caused a power spike in Figure 1 at end of the run. The second run, indicated by blue line, was run on the long ceiling track. 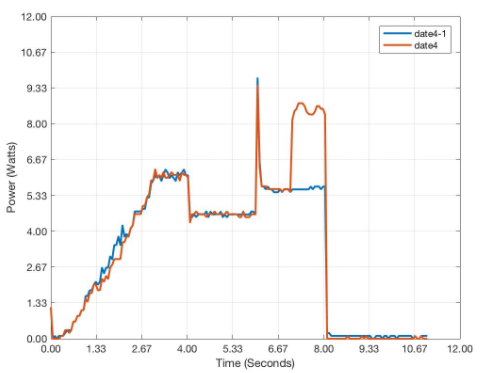 Figure 1 displayed a perfect graph that matched the code instruction transcribed into the arduino. 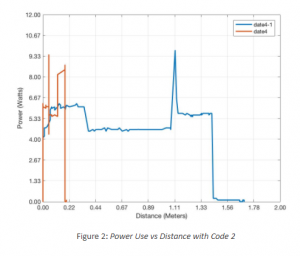 In Figure 2, the blue line showed that the AEV traveled about 1.7 m at a relatively high speed, which matched the 50% power call. After a week of brainstorming and concept sketches, a scoring matrix (Table 1) was used to quickly compare each individual and group designs with the provided reference AEV sketch. The concepts chosen for our scoring system were energy efficiency, balance, maneuverability, time efficiency, cost, and safety. Energy efficiency is focused on the amount of energy required to bring the AEV up to a designated speed in comparison to the reference AEV that was provided. Balance is the ability for the AEV to stay on the track and stay centered, and the maneuverability is the AEV’s ability to quickly change directions and stop. Time efficiency is how quickly the AEV can reach the programmed speed, which is directly affected by propeller placement and weight of the vehicle. The cost is directly affected by the amount of material used in the sample AEVs verse the reference design provided. Finally, the safety of the vehicle is a combination of the balance on the track as well as the placement of materials on the AEV that will prevent fires or hazards. Since the group’s main goals were to create an energy and time efficient AEV while minimizing cost, these three categories carried the most weight in the screening matrix (Table 2). 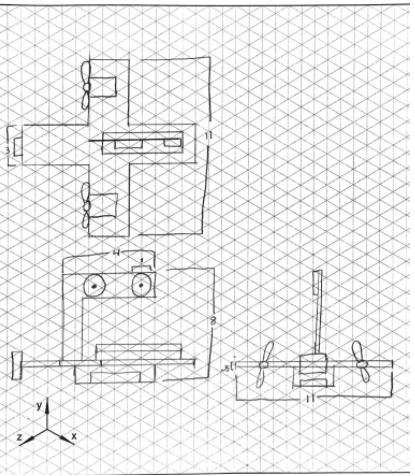 Design A, or Sketch 1, scored well in comparison to the reference. The energy efficiency, time efficiency, and safety were all similar because the materials used were relatively the same between the two designs. However, the cost of Design A was better because the plastic wings on the sides of the reference were removed, and the maneuverability was greatly improved by placing the motors in the middle of the AEV body rather than one end or the other. 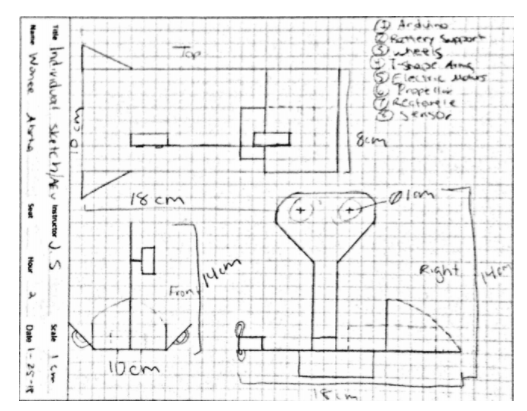 For Design M, or Design 2, balance and maneuverability were equal to the reference because the placement of the motors, board, and battery were similar to the supplied design. The energy efficiency and time efficiency were improved because the design was lighter and had a cover that would reduce air resistance, but the cost would be greater since the cover on the top requires more materials. The overall safety of this design was also slightly better than the reference design because the battery and motors were farther apart, and the balance was more even to prevent the AEV from falling off the track. Design W, or Design 3, had better balance and safety components than the reference AEV because the base was much wider, and therefore made it less likely to tilt off the track. However, the maneuverability and cost were not up to par with the reference AEV because of the additional mass brought upon by the wider base. The energy efficiency and time efficiency also decreased because more power would needed for a larger vehicle to reach a designated speed. Design Z, or Design 4, had a similar balance to the reference AEV because most of the body was similarly designed to the sample. However, the energy efficiency, time efficiency, and maneuverability outrank the reference because attaching the motors directly to the wheels puts all energy into the component causing motion. Therefore, energy would not be lost in generating wind, and the maneuverability improves greatly by directly turning the wheels around. The cost and safety are compromised with this plan because 3D printing is necessary to create a part that attaches the motor to the wheel, and since this has not been tested yet, the safety may be lower if the balance is thrown or a piece breaks. The group design combined several aspects of each individual design, but overall aligned most with Design 1. 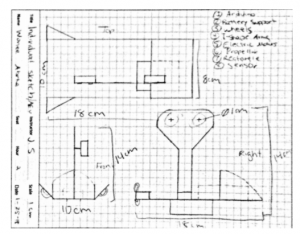 Therefore, the scores for Design 1 and the group design are identical, so the group will combine these designs for advanced research and design. Since Design 4 has the second highest score, the motor attachment to the wheel will also be thoroughly tested during the advanced research and design period over the next several weeks before selecting a final prototype to present. 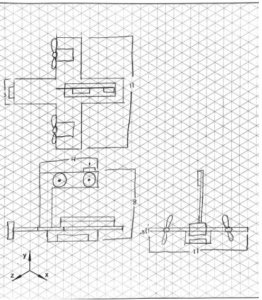 For the AEV design analysis, the group realized that a X-shape base will provide the best maneuverability and spacing of components, which will improve the overall safety and time efficiency of the vehicle. The motors being spaced apart was also an important analysis factor as it allowed for the group to determine the consideration of a start delay on the propellers and how this would affect balance and efficiency. Another important takeaway from preliminary research and design was that the AEV is light enough and travelling at a high enough speed that air resistance does not need to be heavily weighted in the consideration for a design. 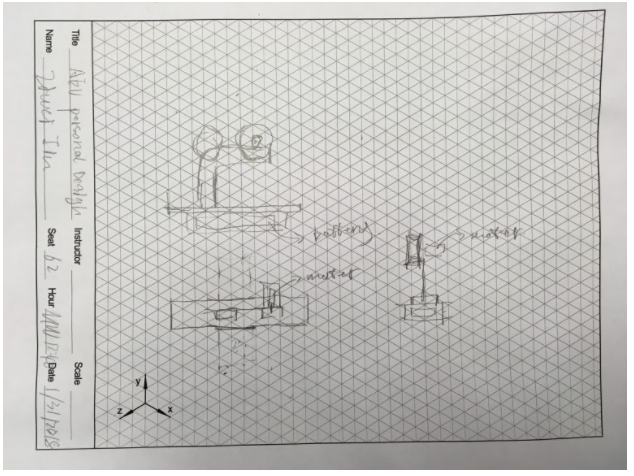 Therefore, the group was able to use less material in the final design while still generating a steady balance of lift force and friction on the track that would allow the vehicle to progress forward. For the overall engineering design project, the group discovered the importance of communication and meeting planning during the first several weeks. After establishing a group chat, the ability to discuss various aspects of the project and specific goals that needed to be achieved became simple to manage when team members were busy or had meeting conflicts. Since each member has a very different schedule than everyone else, the importance of being productive at meetings became apparent. Meeting goals were drafted beforehand and discussed during each weekly meeting, which is a process that will be continued as the project begins to pick up pace. In the future, the group plans to work ahead of the deadlines so ample time is provided for proofreading and other necessary adjustments rather than waiting until the end to compile everything. This was an area that was not a focus during the first several weeks, but would be a helpful way to improve efficiency since everyone has incredibly busy schedules that make collaborating at the same times difficult on most occasions. Post coordinating with the company, energy analysis was chosen as the focus the team. In the next two weeks, additional research and investigation must be conducted to further the team’s understanding of the AEV and energy consumption. Setting objectives, preformming experimental procedures and collecting appropriate data is a part of the team’s research and development phase. The team’s AEV design may be reconsidered, improved, or maintained with the intense consideration of forces affecting the AEV. The upcoming grant proposal is an important opportunity to improve the design concept without increasing spending. The team must plan an effective presentation that will convince the Smart City Team that upon research and the performance test, these materials are necessary to successfully assist in the implementation of the AEV. By week 8, the group must have a research and development presentation completed that will share their findings and explain the methodologies used thus far. Table 3– Goals for week 5-8. Table 4– Schedule for Group P from week 5-8.
goFor(1); // Keep motor one running at 15% for 1 second. 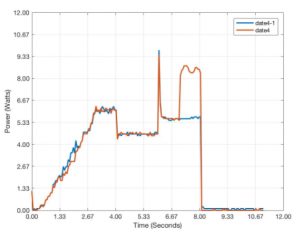 celerate(2,27,15,1); //Decelerate motor 2 from 27 to 15% over 1 second. Objective: This meeting was used as a time to create our portion of the website and to establish general areas that could be improved to make the AED more efficient. We also used this time to draft up an introduction to our division of the Koffolt Lab company and created a few additional drop-down options on the website. Topics Discussed: Furthered role discussion. Website update priorities and responsibilities. Future lab work. Objective: Distribution of workload for completing the second website update. To/do Action Items: Reformat group webpage interface. Add in new website deliverables for recently completed labs. 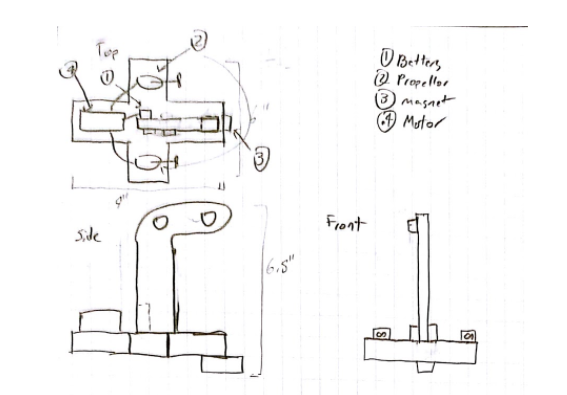 Individually upload preliminary sketches with personal explanation of design choice. Decisions: Each team member was assigned a role they were comfortable with both for this website update and moving forwards. Reflections: Meeting in person can be challenging with people being physically far from one another based on schedules, so using an online voice chat system might be a viable alternative.